Kansas is an outstanding place for the beginning bird watcher, with hundreds of places to look for a wide variety of bird species. All you need is some basic gear to start watching everything from giant whooping cranes to Kansas’ 40-plus species of tiny, but vibrant warblers. One of Kansas’ most experienced birders, Mike Rader, has these suggestions. A quality pair of binoculars is a birder’s most important piece of gear. Most are described with two numbers, such as 10x50. The first is the magnification at the eyepiece. The second is the size of the objective lens, the lenses farthest from your eye. Rader said magnifications of eight or ten- power, the most commonly available, work great. Those birding in tight quarters like the woodlands areas of eastern Kansas or your own yard may do best with eight-power. Those at wide-open habitats, like western Kansas prairies or huge marshes like Cheyenne Bottoms, will do best with ten-power. Avoid compact binoculars with small diameter tubes. Images are usually low quality. They also don’t gather enough light for optimal birding in twilight conditions. Binoculars with objective lenses around 40 mm are a good average. Much below 32-35 mm and there’s not enough light-gathering capability. Binoculars with 50 mm or larger can be bulky and hard to hold steady. It’s smart to shop at a major outdoor retailer. As well as getting good advice, you can try several brands and styles to see what is the most comfortable for your eyes and your hands. Inexpensive binoculars are usually of poor quality, so buy the best you can afford. It is possible to get a decent pair for around $150. Quality and options improve once you get around $300-$500 and higher. 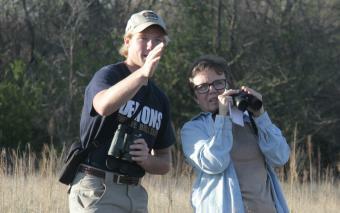 Another good option is to sign up for a field trip with a local Audubon club or the Kansas Ornithological Society. Many birders will gladly let you handle and look through their binoculars to give you an opportunity to check out different features. A good quality field guide is one of the best tools to help make positive identification of the birds you see. Many are available, but search for a guide by a top-name publisher, like National Geographic,Kaufman, Audubon or Sibley. Many of the best guides have several paintings or photos of each species, with information about what to look for to make a positive identification and accurate range maps for those species. Many guides are regional, so make sure you get one that encompasses Kansas. A Kansas-specific book worth the money is “The Guide to Kansas Birds and Birding Hot Spots,” by Kansans Bob Gress and Pete Janzen. 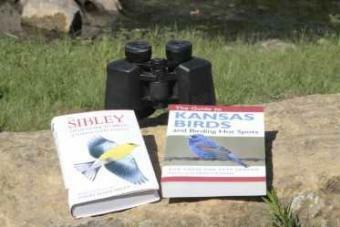 It gives detailed information about preferred habitats and lists 28 of the best all-around birding sites in Kansas. The world of technology and smart phones has created dozens of apps for birders. Some of the most popular and practical are free, such as Merlin Bird ID, Sibley Birds - Lite, iBird Lite and Birds Near Me. Sibley and iBird offer more advanced apps for $20 or less. Larkwire is an app that’s also popular.